Join APA Los Angeles and the Latinos and Planning Division for an evening at the Hola Mexico film festival, the largest Mexican film festival held outside of Mexico – now celebrating its 10th year! 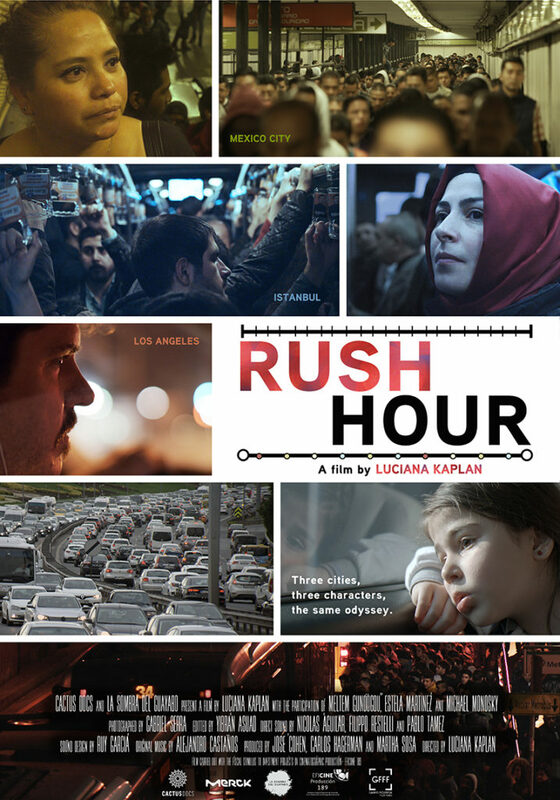 We’ll gather on Sunday, June 3, for a screening of director Luciana Kaplan’s documentary film “Rush Hour,” which captures an experience that is regrettably global — our daily commutes. Buy your own ticket and meet us outside Regal Cinemas at 6 PM for the 6:30 screening. Afterward, we’ll head to a nearby LA Live venue for drinks and discussion of the film. Following three parallel stories of people living in three of the world’s most emblematic and highly populated cities: Mexico City, Los Angeles, and Istanbul, “Rush Hour”captures its characters’ daily odyssey moving between home and work. Although their contexts are distinct, they share the fact that they spend almost half of their lives on the road trying to make a living. All three feel they are losing something essential through their commute: time with their love ones and the things that truly matter. Siguiendo tres historias paralelas de personas que viven en tres de las ciudades más emblemáticas y pobladas del mundo: Ciudad de México, Los Ángeles y Estambul, RUSH HR captura la odisea diaria de sus personajes al trasladarse entre el hogar y el trabajo. Aunque sus contextos son distintos, los tres comparten el hecho de que pasan casi la mitad de sus vidas en camino a tratar de ganarse la vida. Los tres sienten que están perdiendo algo esencial a través de su viaje cotidiano: el tiempo con sus seres queridos y las cosas que realmente importan. The film will be shown in Spanish with English subtitles. Parking: Parking is available in Lot E at Olympic & Figueroa for $10 for the first two hours. Some establishments validate. Transit: LA Live is convenient to Pico Station on the Metro Blue/Expo lines or the 7th St/Metro Center station on the Red/Purple lines.